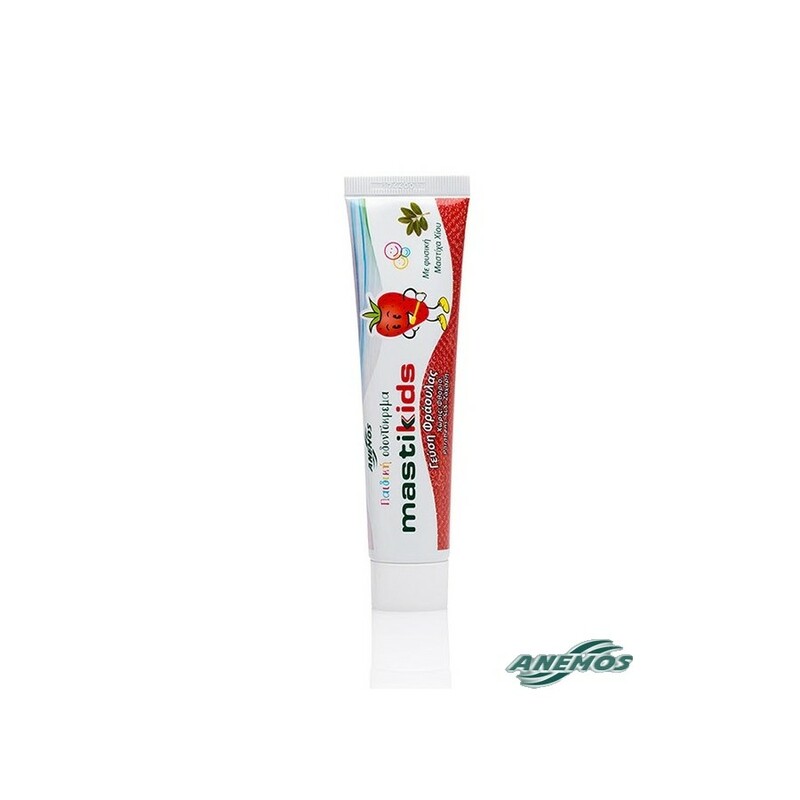 Pure, natural children's toothpaste with a fruity and pleasant strawberry flavor. In our online shop we sell: Products with natural gum Mastic of Chios island, Greece. Other words for Chios MASTIC are: MASTIHA, MASTICHA, MASTIKA, MASTIXA, mastix. Top quality Greek products with real natural mastic. parabens free Homeopathy Mastic & herbs toothpastes (dental paste) without fluoride with extra quantity of mastic (mastic oil) and bio (biological /organically grown) camomile (chamomile). Oral hygiene with quality toothpastes and mouthwash. Suitable for children. Homeopathic toothpaste with real mastic and natural mandarin (tangerin) fluoride free Deantal care with pure mastic and bio (organically grown) spearmint. toothpastes parabens free Natural Cosmetics with mastic without parabens. Online sales in our mastic shop ” HOMEOPATHIC TOOTHPASTE WITH MASTIC. MASTIHA TOOTHPASTE. HOMEOPATHY TOOTHPASTES, MINT FREE TOOTHPASTE, whitening toothpaste with mastic and mastic oil. Mastic or whatever you call it Mastika, or mastiha, or masticha, or mastixa, the truth is that Chios gum mastic is miraculous Chios products, traditional Hellenic (Greek and Chian) products from Chios “the island of mastic. HOMEOPATHIC TOOTHPASTES. homeopathic oral hygiene. Fluoride free toothpastes without fluoride which is accused for... Parabens free oral products form Greece. Natural toothpaste, oral wash, mastiha toothpaste, herbal toothpaste, homeopathic toothpastes. voted as among the 100 top products! natural greek toothpaste. best ORAL HYGIENE.